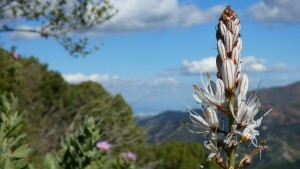 The Ecological Reserve, by its geographical location, its orography and its history attached to human, includes a rich variety of environments (pine forests, plantation of oaks, chestnuts, Mediterranean thickets and ancient crops…) which translates into a great floral richness contained in a small area. This tranforms this place into an authentic Mediterranean “botanical garden“, a living witness of soil usage changes and Human habits. 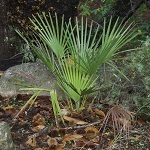 The Mediterranean maquis here consists of dense mantle formed by lentiscus (Pistacia lentiscus), dwarf palm trees (Chamaerops humilis), villosa calicotomes (Calicotome spp), junipers (Junipers oxycedrus), aromatic plants such as rosemary (Rosmarinus officinalis), lavender (Lavandula spp), thyme (Thymus spp) and others such as Jerusalem sage (Phlomis purpurea), broom (Retama sphaerocarpa), asphodel (Asphodelus spp), esparto grass (Stipa tenacissima) and many others. All are coloured, or aromatiques and have particular property or use, However, we put the accent on some of them such as the broom of haenseleri (Genista haenseleri) because of its fragility or the orchids, ery pretty and interesting plants since they manage to lure insects. Also differs thepurple foxglove (Digitalis spp.) 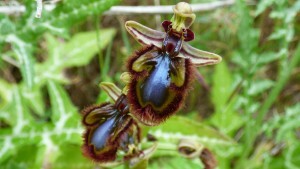 because of its dense presence in an area of the reserve. 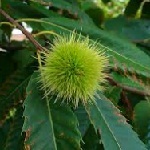 The thicket is one of the ecosystems but in addition to that, the area is home to a small chestnut (Castanea sativa), which in autumn the most magical place of the Reserve. An area populated by oaks (Quercus suber), the most local tree of the area near the holm oak (Quercus rotundifolia), scattered throughout the enclosure. Others typical trees of the area related to the human being are the wild oliver tree and the oliver tree (Olea europaea), almand tree (Prunus dulcis) or carob tree (Ceratonia siliqua).And there are also others areas of pine forests, small pines (Pinus halepensis) and Monterrey pines (Pinus radiata). Here are some of the hundreds of flowers present in the Ecological Reserve. Each season of the year has its own interest and throughout the year we will find species that will surprise you, by their stories, their uses and their adaptations. Don´t think twice! 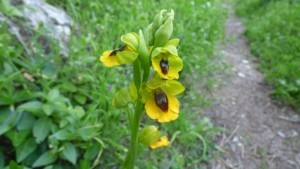 Come to enjoy and discover our wildlife and flora! This is the unique european local palm tree,it is rare to see it reach a large size. Common in the Mediterranean mouth, it produces fruits that serve as food for multiple animal species and disperses its seeds in others territory that its own. 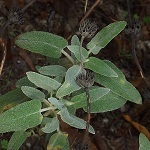 It is present throughout the reserve and it is common to pass very close to specimen of different ages brushing with its large leaves the legs of visitors walking on the trails.